The Adelante Movement: Bravo Gina Rodriguez! 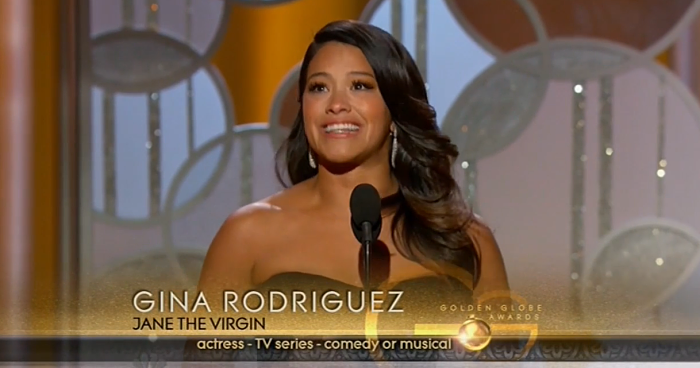 Gina Rodriguez won the Golden Globe last night for her role as Jane the Virgin on the CW. Her speech teaches us all that anything is possible and that we all have to support each other. Gina said in her speech that her dad had told her that everyday you wake up and say "Today is a great day. I can and I will." She then said, "Well dad, today is a great day. I can and I did." Yes you did and you make us proud! Click HERE to watch Gina's tearful acceptance speech. Let's support Gina Rodriguez and her show, Jane The Virgin on the CW- let's watch her every week. I honor each of you and your dreams, and I know you can and you will! Everything begins with a first step. How is your list of three things you want to complete in 2015? Write down three baby steps to completion!